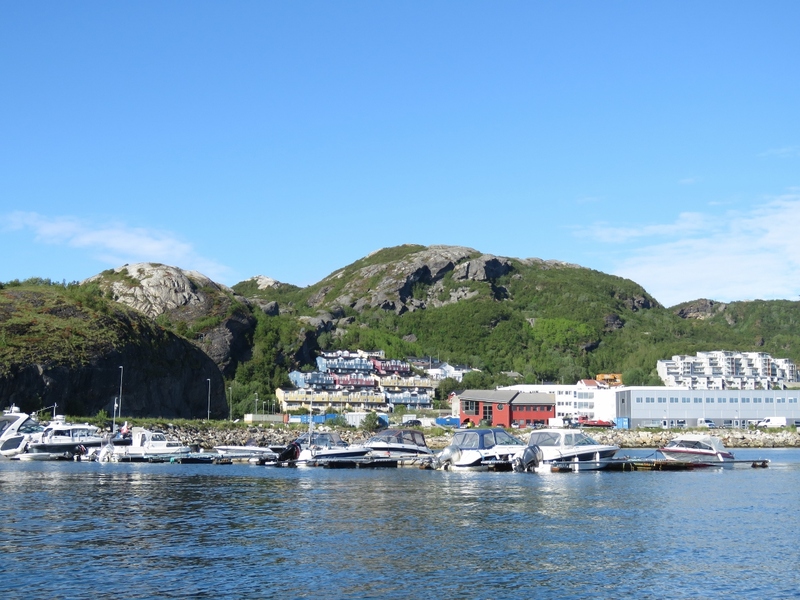 Bodø, Norway was the ultimate destination of American pilot Gary Powers’ ill-fated U2 flight that garnered international attention in 1960 when he was shot down and captured over Russia during a high-altitude surveillance pass. 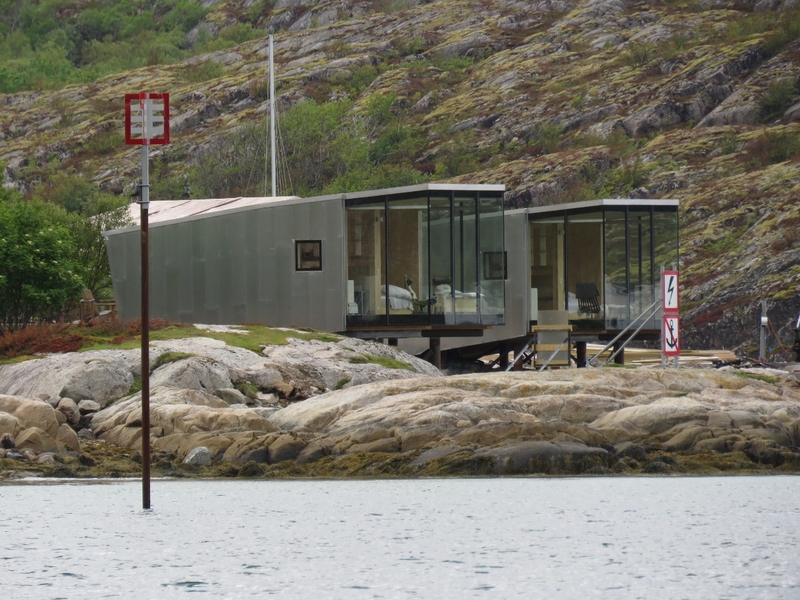 The exceptional Norwegian Aviation Museum there has a vast collection, including a U2 spy plane, that we’d been looking forward to visiting for months. 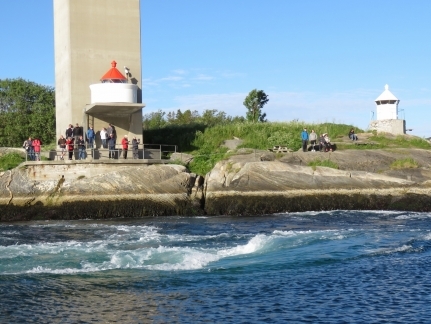 Another Bodø attraction is the nearby Saltstraumen Maelstrom, among the fastest in the world. When the moon is full, the rapids can run at nearly 20 knots—we ran the tender over to check them out maximum ebb. 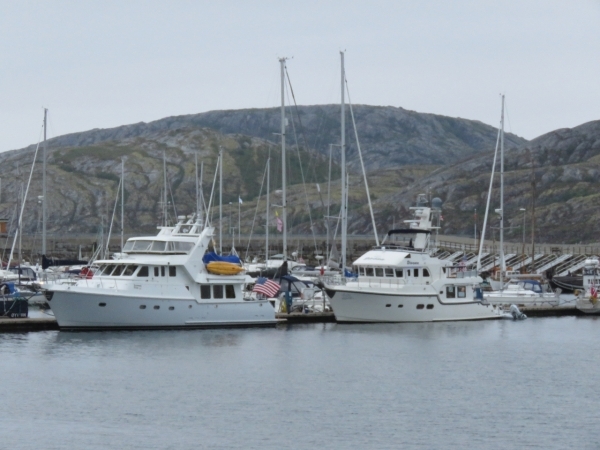 And Bodø is where we finally crossed paths with Nordhavn 57 Summer Star owners Kristina Thyrre and Atle Moe who were heading north as we are returning south. We’d been corresponding for years, much more so recently since we’ve both been in Norway, and it was wonderful to meet in person. 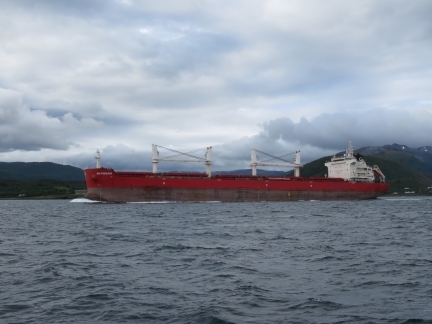 The 652-ft (199m) bulker SBI Phoenix en route to Narvik at the mouth of Ofotfjorden. 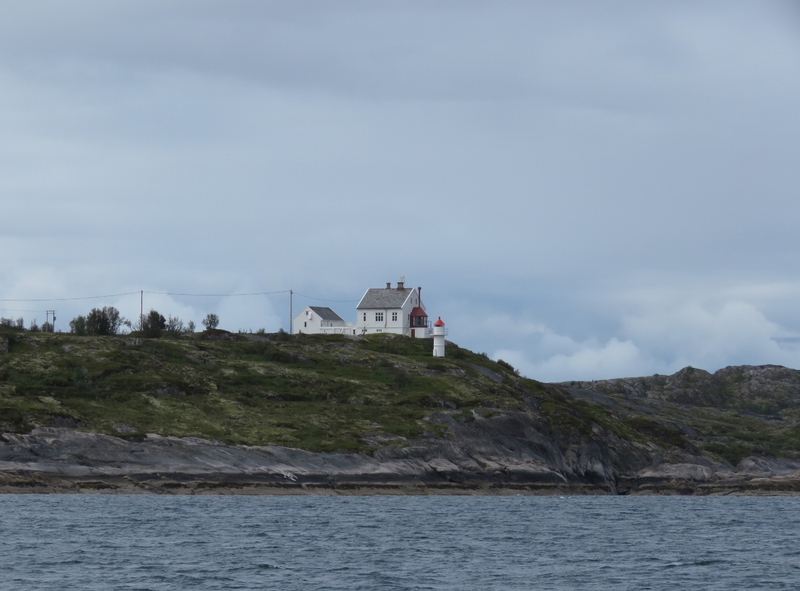 Dramatic bald cliffs to our south as we pass Tysfjorden. 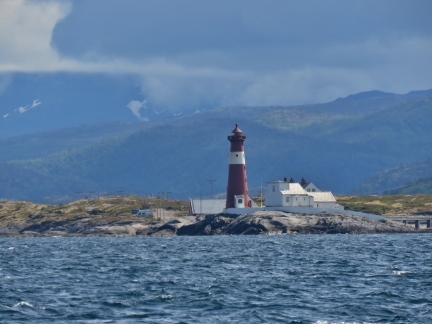 The 90 ft (27.5-metre) Barøy Lighthouse was built in 1903 and automated in 1980. 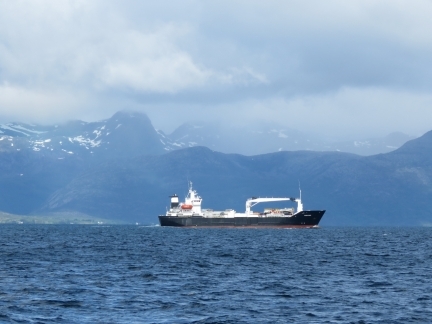 The freighter Silver Pearl to our west, with the mountains of the Vesterålen islands visible in the distance beyond. The 948ft (289m) bulker Cape Heron en route to Narvik. We seem to be back on the main shipping channel and are seeing a lot more commercial traffic than we have in the past month or so. The 89 ft (27-metre) round cast iron tower of the lighthouse on the island of Tranøy. 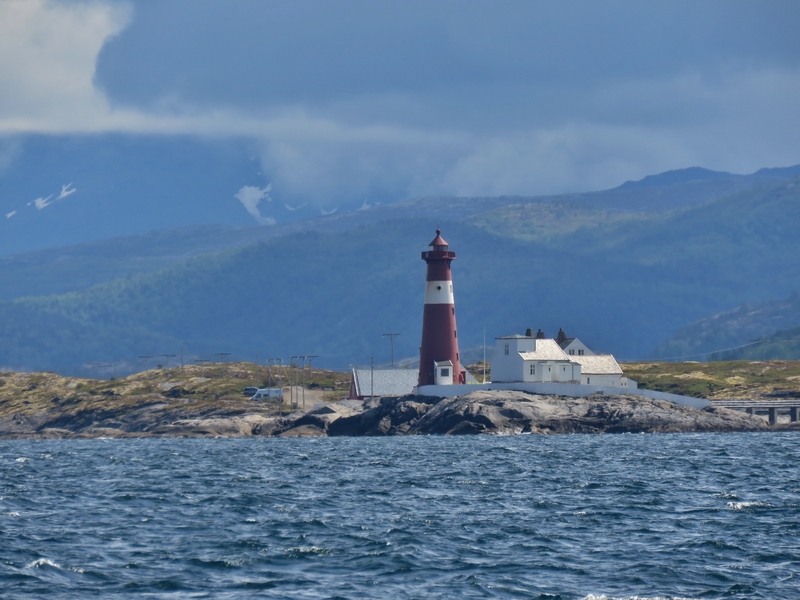 The lighthouse has been developed as a tourist attraction and has superb view across to the Lofoten Islands. 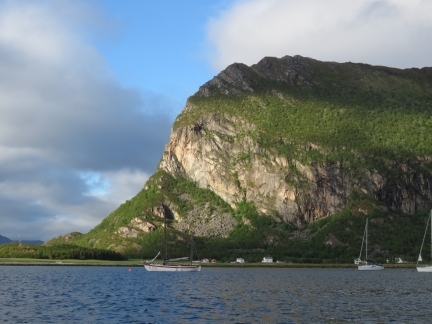 Spectacular Stetind (“Anvil of the Gods”) mountain in Tysfjorden. 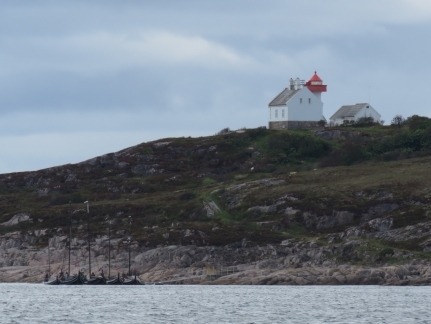 A fleet of replica Viking boats moored beneath the lighthouse on the island of Flatøya. 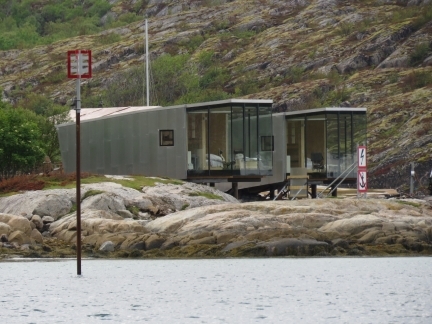 Two beautiful cabins overlooking the anchorage at Nordskot. 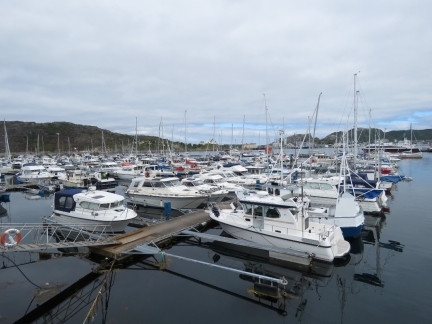 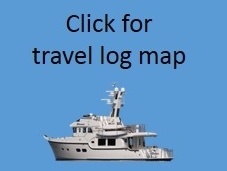 When we first arrived at Nordskot, several pleasure craft were on moorings with a few spaces open in the marina. 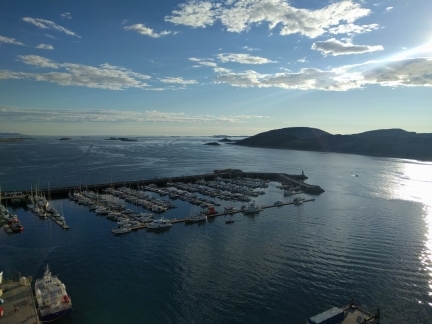 Over the course of the evening at least a dozen more arrived, rafting five deep on the moorings in places and three deep on the docks. 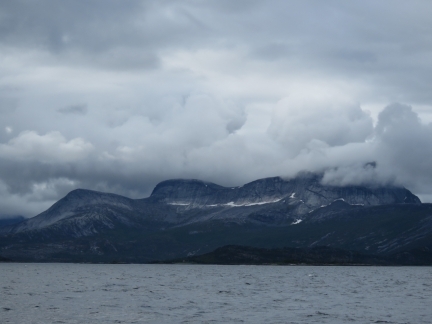 We’re told rafting on Norway is commonplace, but we’ve not seen anything like this so far. 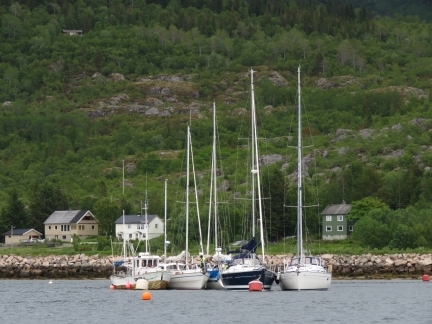 Norwegians typically take vacation in July, so perhaps this is the start of the busy season. 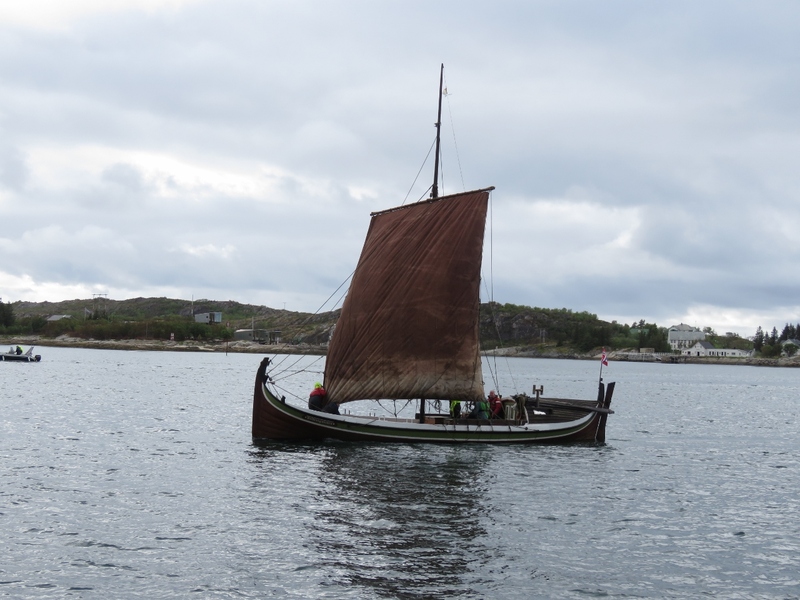 The fleet of Viking boats we’d passed earlier at Flatøya also arrived and moored against the commercial dock at Nordskot. 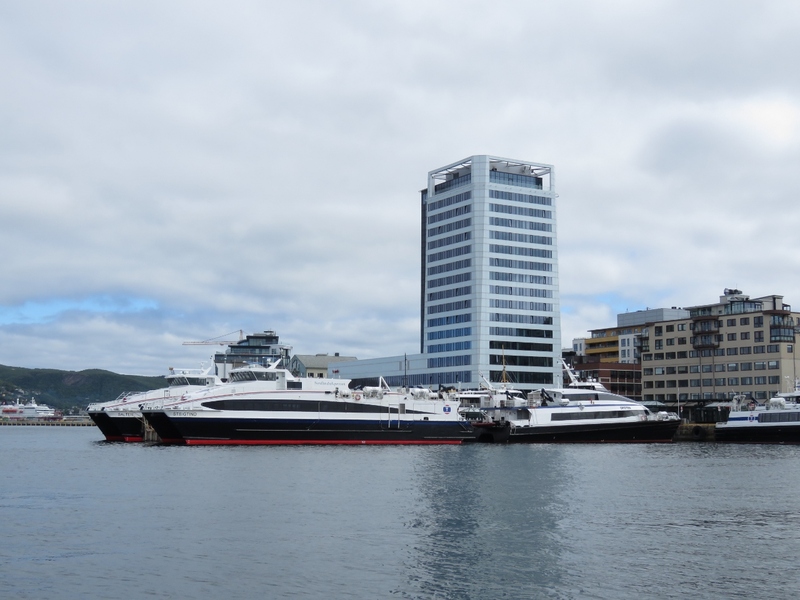 We’d anchored several hundred yards off the commercial dock, but it still felt pretty close when the fast ferry Steigtind loomed through our port windows. The evening sun lighting up the cliffs north of the anchorage at Nordskot. 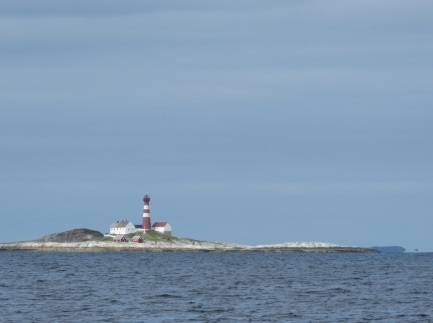 The 95-ft (29 m) iron tower of the Landegode Lighthouse was erected in 1902. 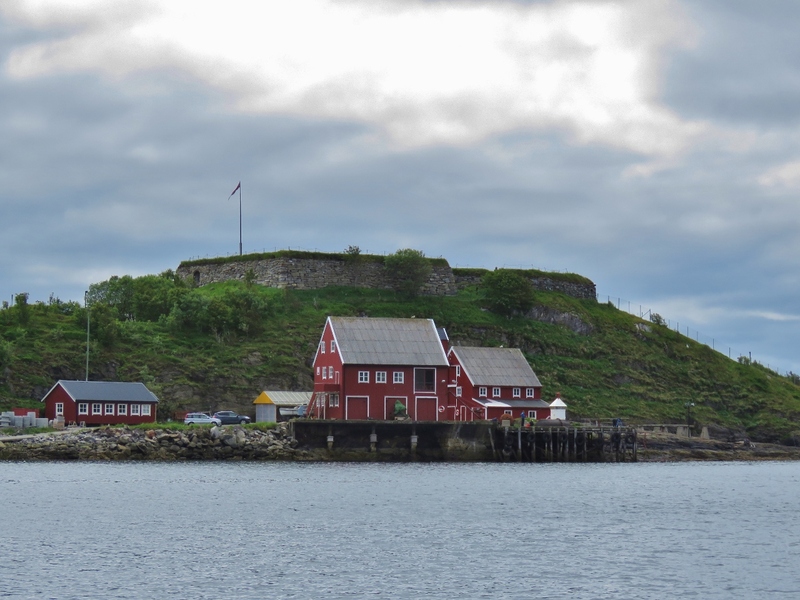 Bremnes Fortress was built in World War II by the occupying Germans to protect the entrance to Bodø harbor. 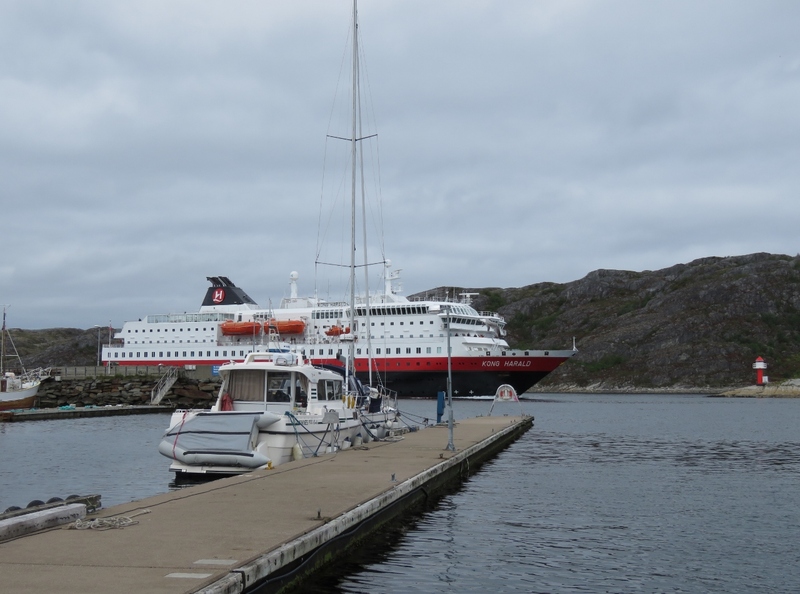 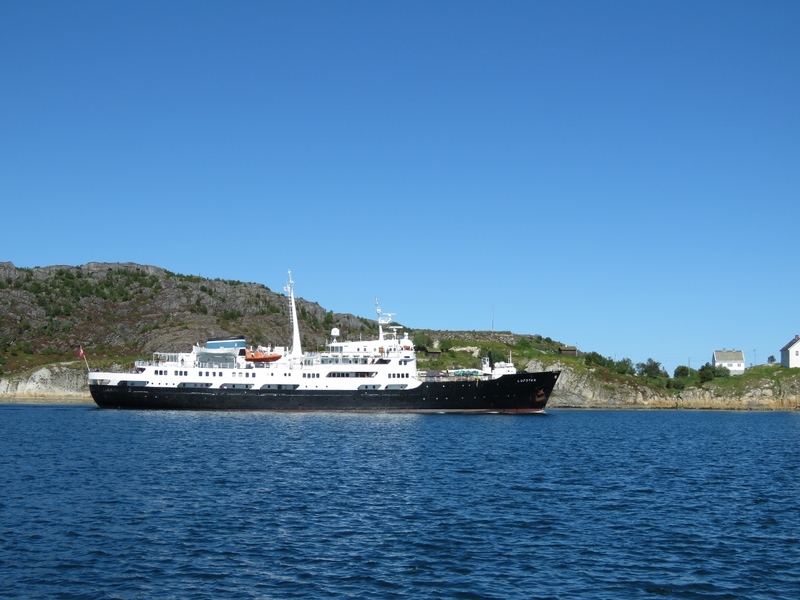 Our ‘Gruten, the Kong Harald, arrived into Bodø shortly after we did. Since dropping us off in Tromsø six days ago, the Kong Harald has completed the trip south to Bergen and now is returning north. Looking across the recreational docks in Bodø Havn. 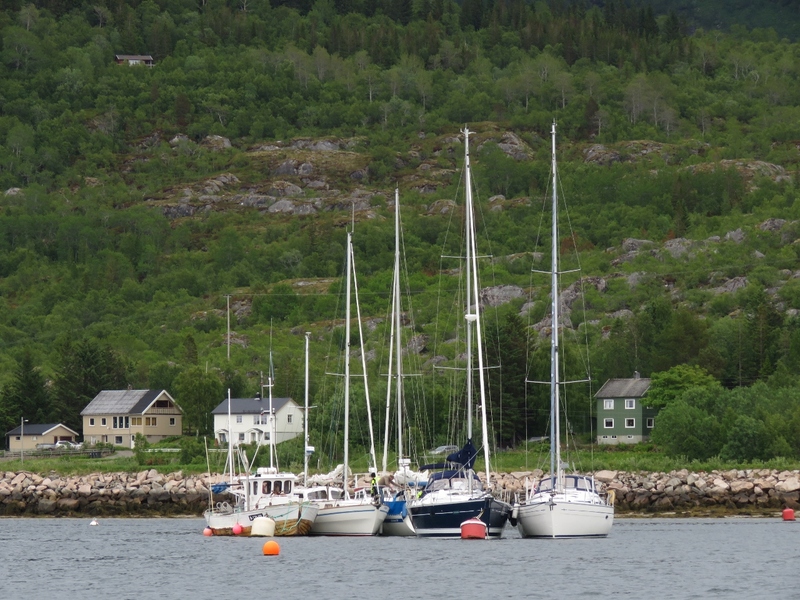 Dirona is just visible on the other side of the marina at center (click image for a larger view). 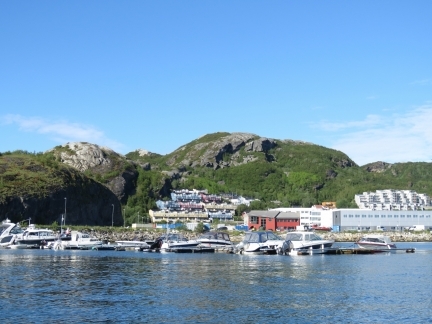 Bodø is the terminal for several fast ferries that run to the Lofoten and Vesterålen Islands. 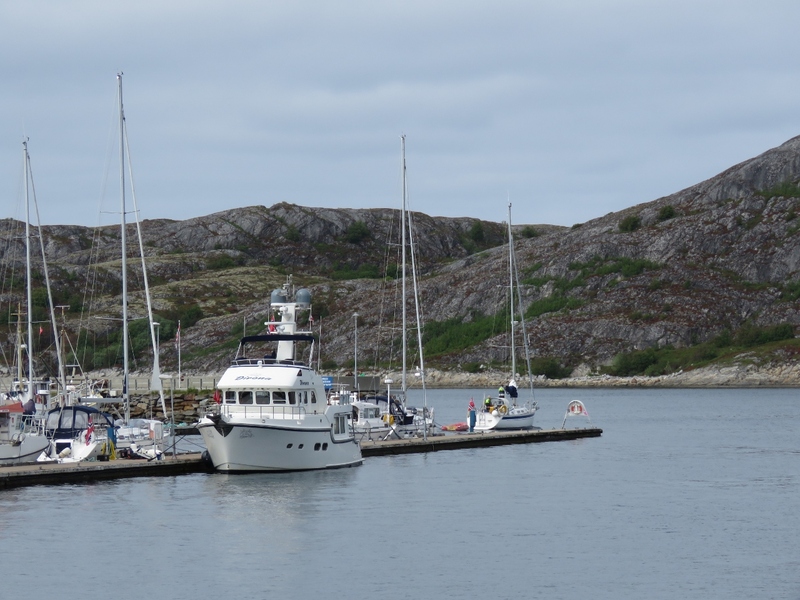 Dirona moored on the guest dock at Bodø Havn. 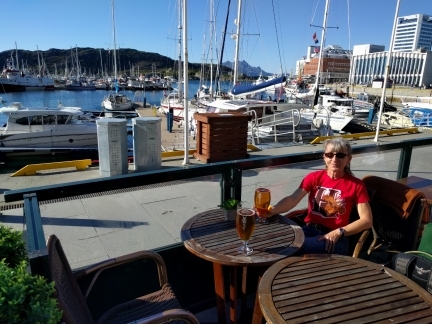 We had a good lunch with a great harbor view at Bryggerikaia. 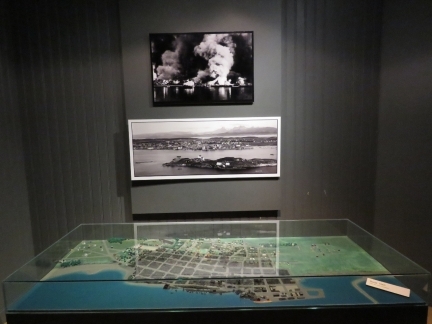 The small but information-packed Nordland Museum on Bodø details the towns history, particularly the destruction during World War II when a 1940 German bombing attack levelled much of the town center. 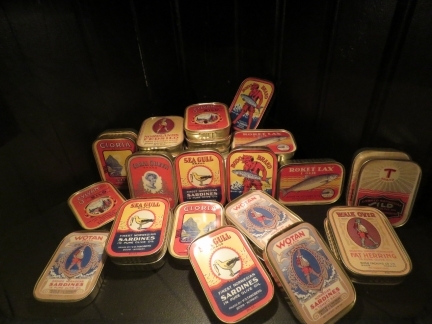 A display at the Nordland Museum showing various brands of canned herring, once a major Bodø export. 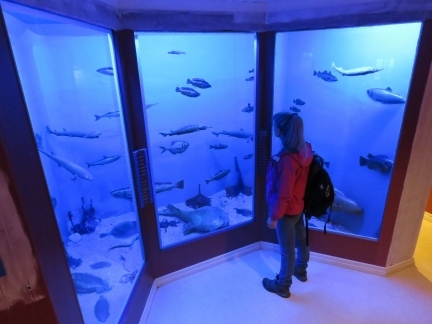 Dry aquarium in the basement of the Nordland Museum. The display was created to teach fishers how to identify fish found in the ares. 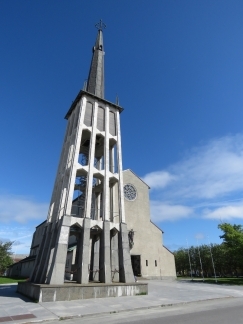 Bodø Cathedral was completed in 1956. It replaced an earlier church that was destroyed during the World War II bombing. Bodø’s city hall also was destroyed in the World War II bombing and rebuilt in the 1950s. 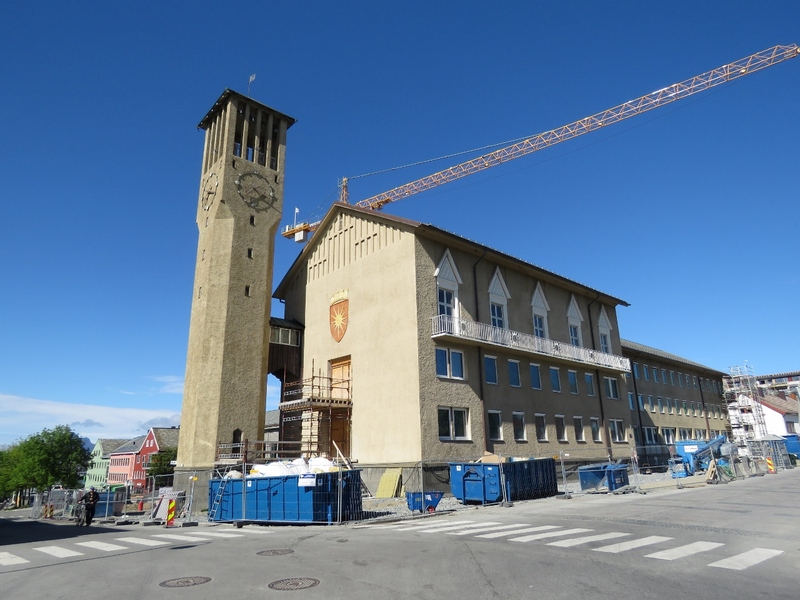 A dramatic new city hall building is now under construction. 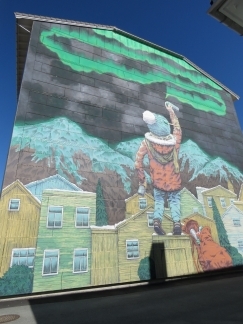 Wonderful street art in Bodø showing a youngster painting the Northern Lights onto the sky. 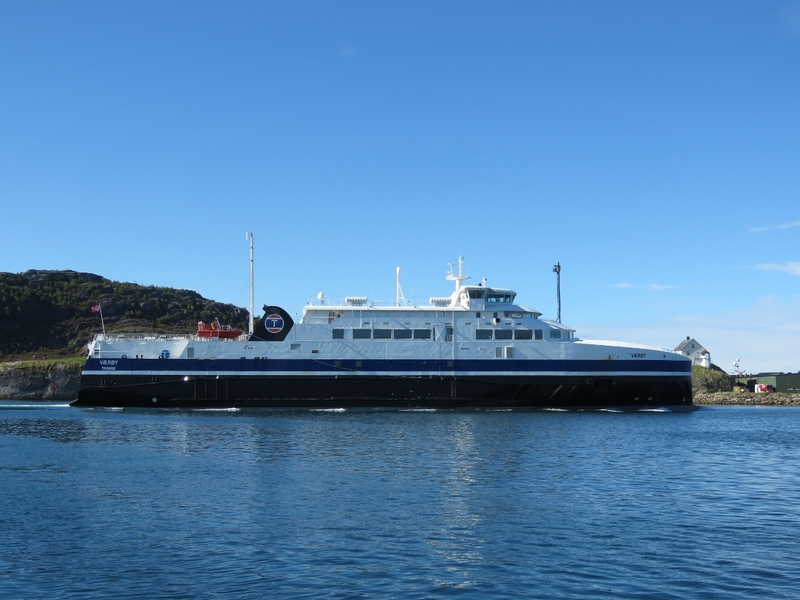 The ferry Værøy arriving into Bodø from Moskenes, just south of Reine in the Lofoten archipelago. After walking around town, we took the tender on a tour of the harbor. 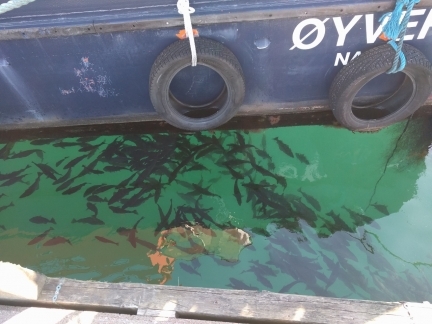 This is a small pontoon at the north end of the harbor. The 305 ft (93 m) Norwegian Coast Guard vessel Barentshav moored at Bodø Harbor. 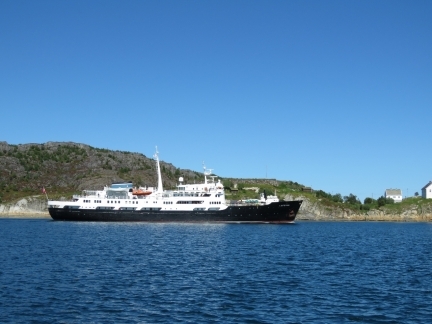 Delivered in 2009, the Barentshav is the coast guard’s first LPG vessel and can reach speeds of 20 knots. Spectators gathered along the shore near Bodø to watch the Saltstraumen Maelstrom, among the fastest in the world. 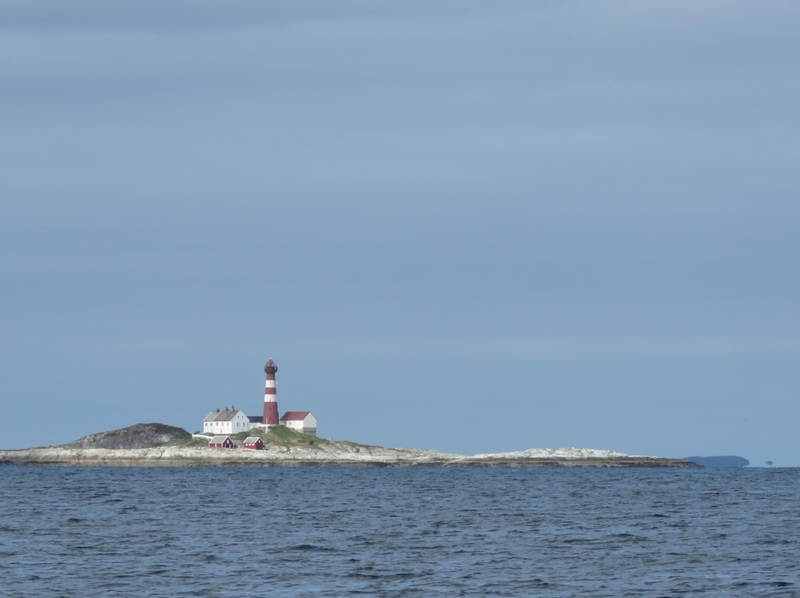 When the moon is full, the rapids can run at nearly 20 knots. 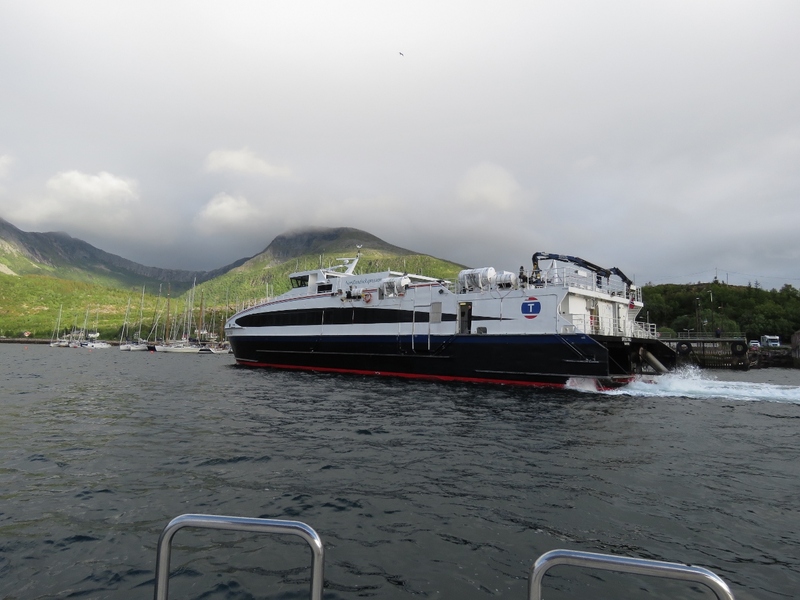 The video https://youtu.be/rAMC4hlXtgM shows us making a pass through the channel with the rapids running at maximum ebb, creating huge whirlpools and upwellings. The Hurtigruten Lofoten arriving into Bodø on a northbound run. 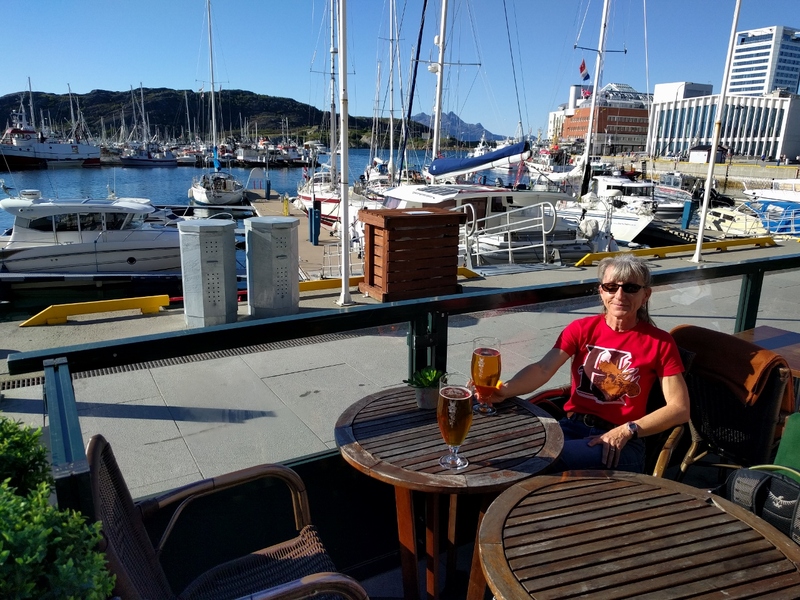 Bodø ‘s midnight sun period ends in ten more days, and we’ll be out of the midnight sun zone sooner as we continue south. 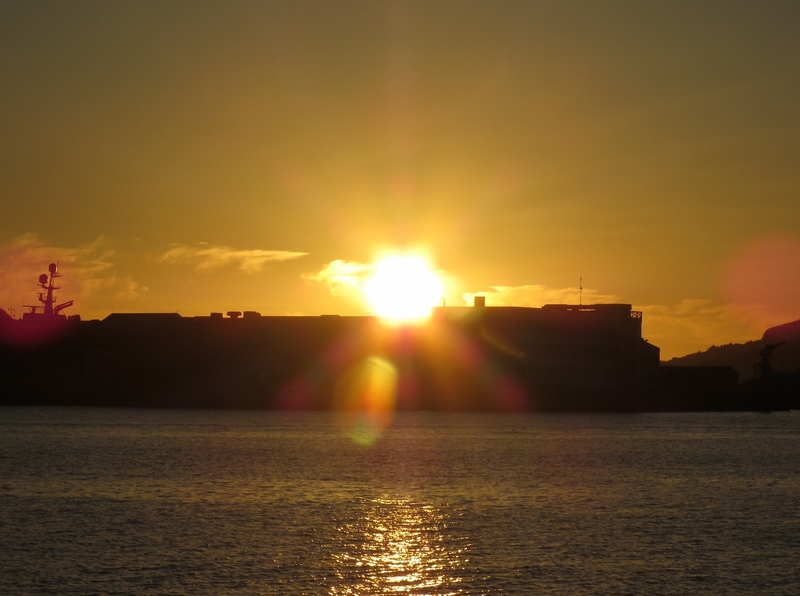 We woke up around 2am and snapped this photo of the sun rising back up above the horizon. 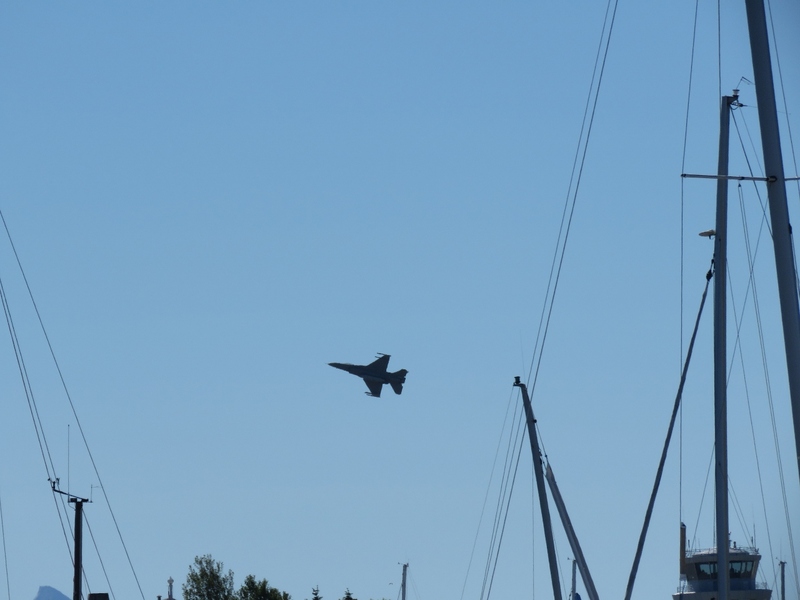 F-16 fighters from the nearby Bodø Main Air Station made frequent passes over the area while we were there. The water in the harbor is incredibly clean and clear with a healthy fish population. 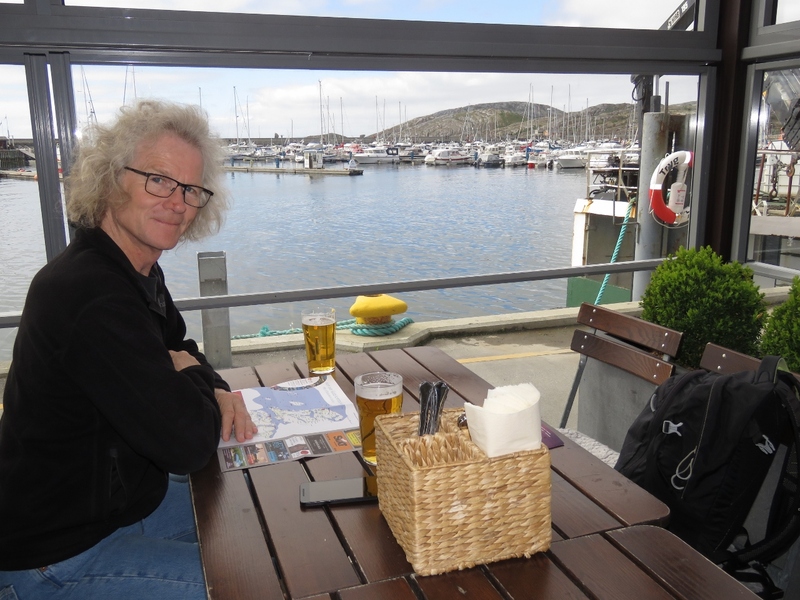 Under a clear sky with the temperature nearly 70°F (21°C), we had a wonderful meal al fresco at Egon overlooking the harbor. 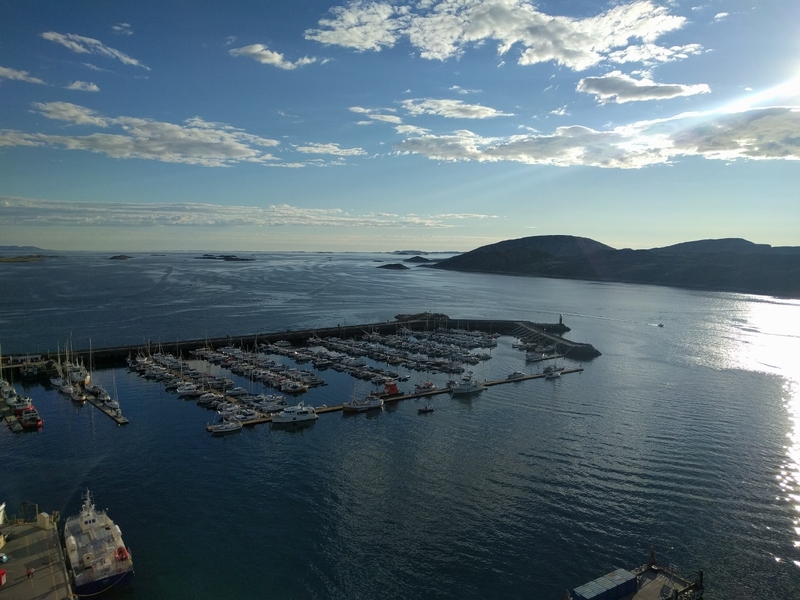 After dinner, we went up to sky bar in the Scandic Havet for 360° views of the area. 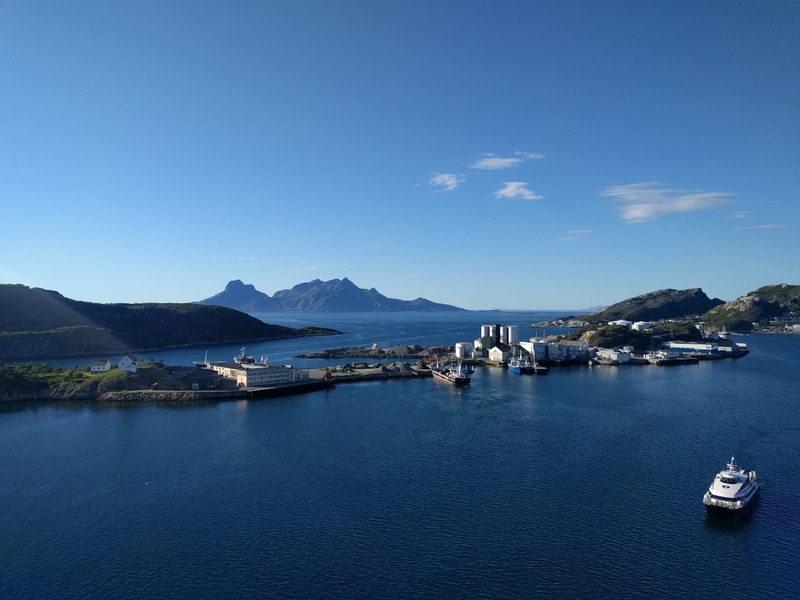 (At 18 floors high, this is northern Norway’s tallest building.) This is the view looking northwest to the channel we came through before entering Bodø Harbor. Bremnes Fortress is just out of the picture on the left. 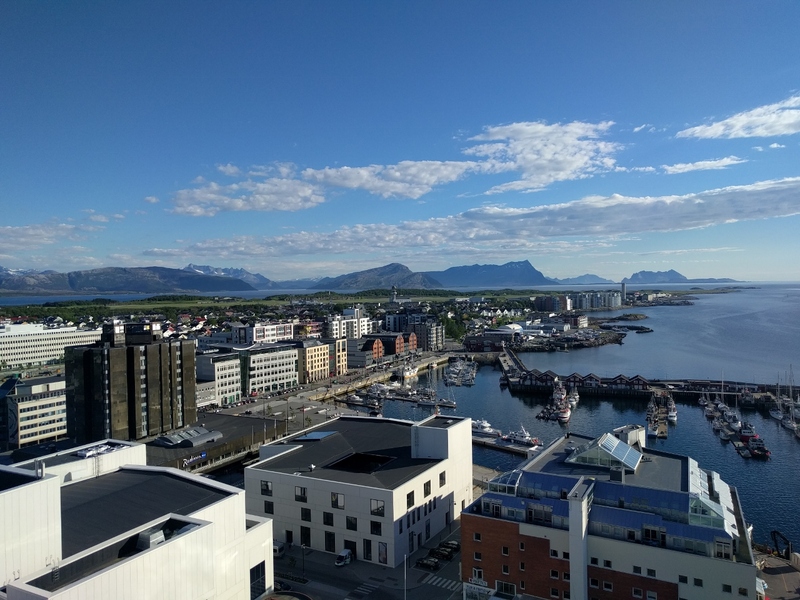 The view looking southeast from the Scandic Havet sky bar. We had dinner at Egon, across the street from the yellow buildings about center in the picture. 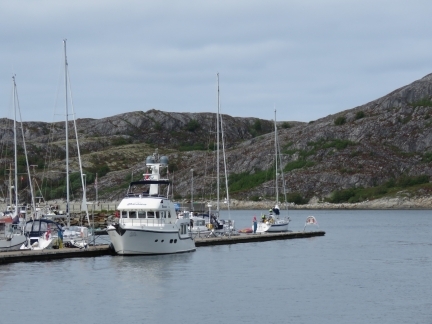 Dirona moored on the guest dock, viewed looking southwest from the Scandic Havet sky bar. 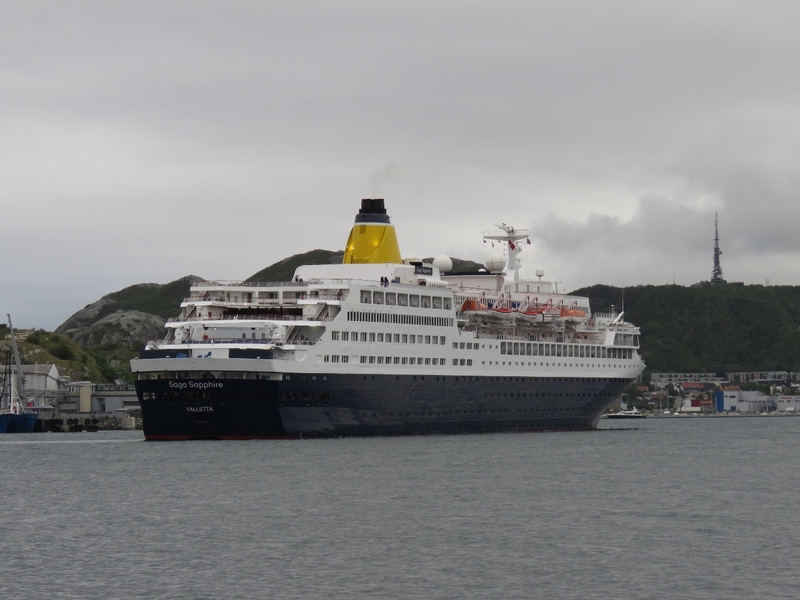 The 655ft (200m) cruise ship Saga Sapphire arriving into Bodø. 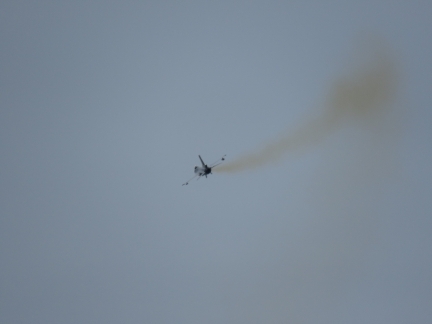 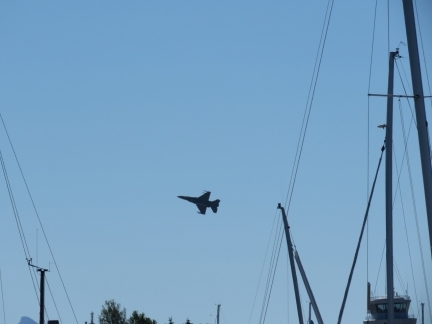 F-16 fighter taking off from Bodø Main Air Station. Bodø has an exceptional aviation museum that we’ve been looking forward to visiting for months. This is the vast commercial aviation section, with displays ranging from the early days of flight to modern times. 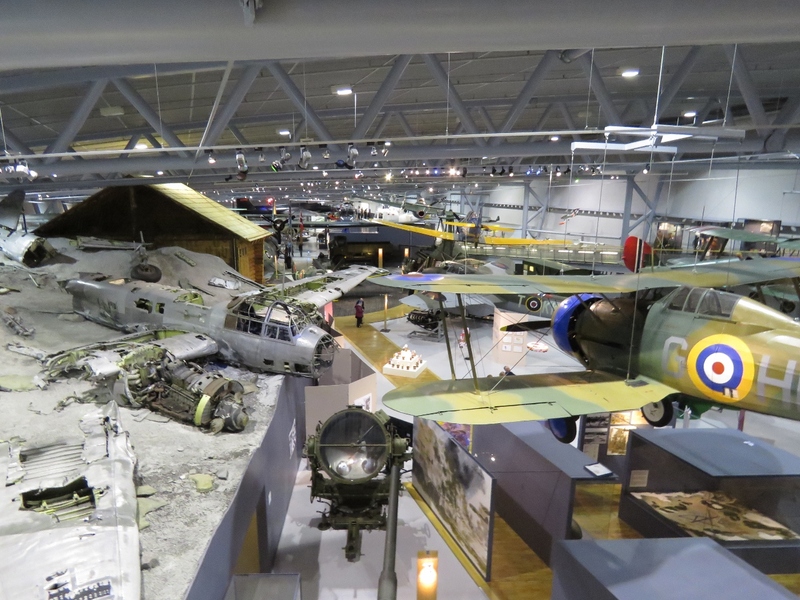 On the left is the recovered wreck of a German Junkers Ju-88 A-4 that was found in the Norwegian mountains and transported piece-by-piece to the museum. 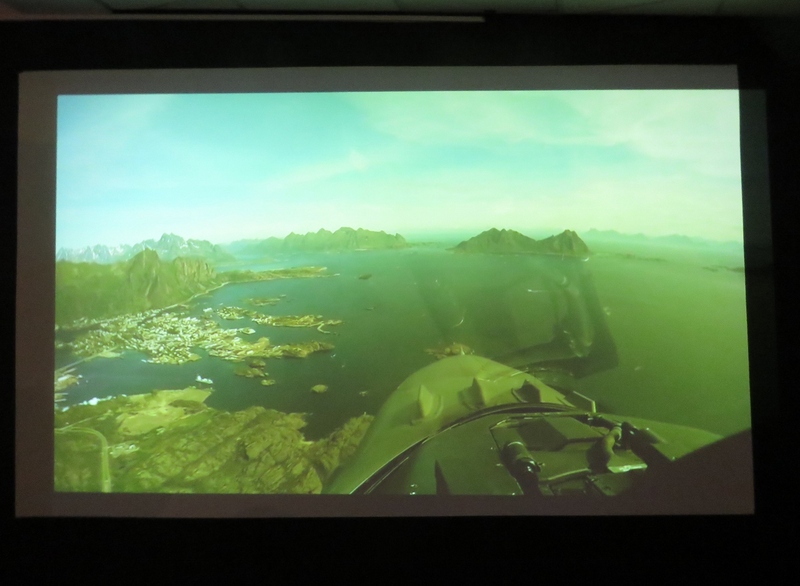 We spent ages at the Norwegian Aviation Museum watching aerial footage from a jet flight over northern Norway, recognizing many places we’ve visited. 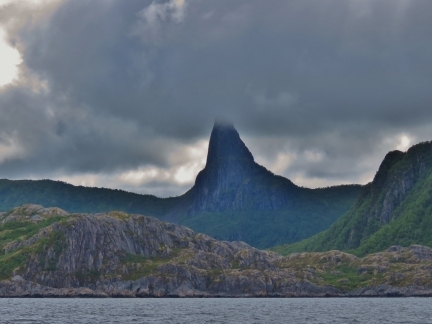 This shot is approaching Svolvaer from the south. 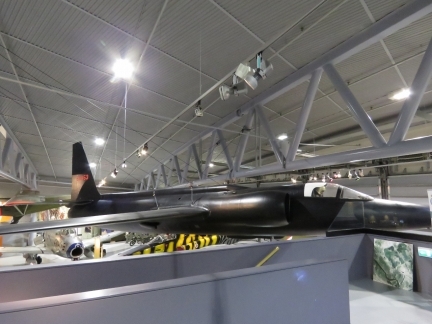 A U-2 spy plane is one of the feature displays at the Norwegian Aviation Museum. The U-2 program gained international attention in 1960 when the Soviets shot down and captured American pilot Gary Powers while he was making a high-altitude surveillance pass en route from Peshawar, Pakistan to Bodø, one of the permanent stations for the U-2 operations. The excellent movie Bridge of Spies describes the events leading up to Powers’ capture and ultimate release. We loved this photo at the Norwegian Aviation Museum of a 1965 Christmas mail drop to Bjørnøya, a remote Arctic island. 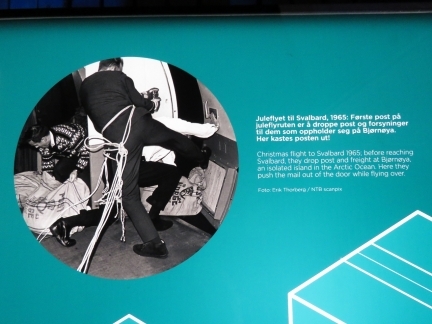 Two men, roped to the plane, are opening the door mid-flight to push mail and freight out as they fly past. 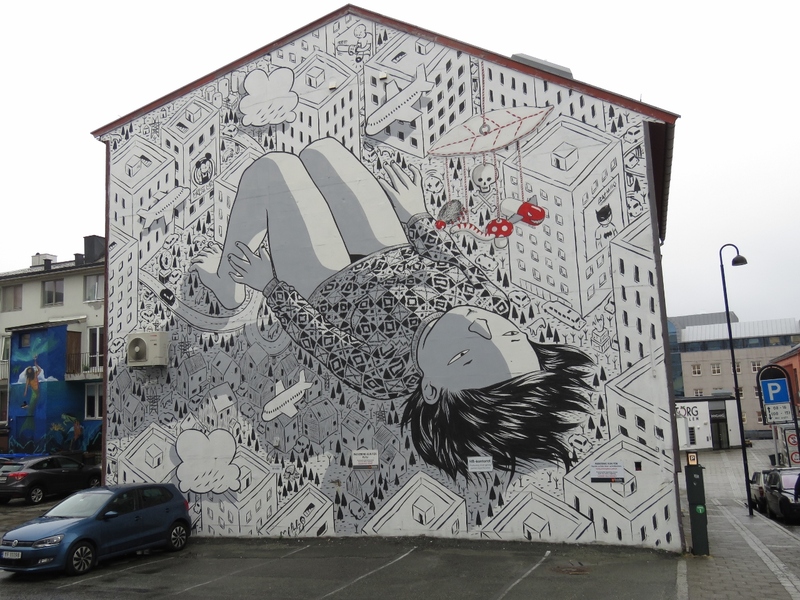 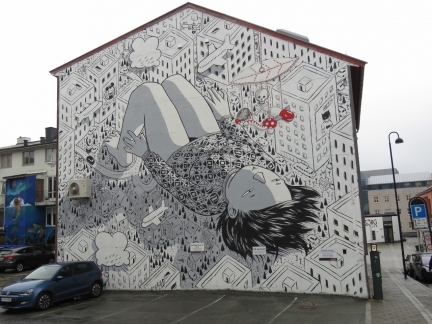 More fabulous street art in Bodø, this one Insomnia by the Italian street artist Millo. 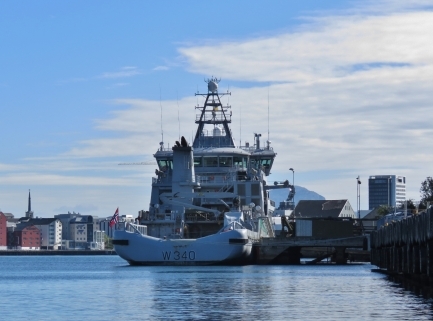 Docked bow-to-stern Nordhavn 57 Summer Star in Bodø. 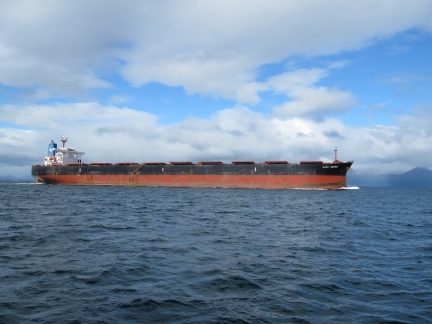 We’ve not seen a single other US-flagged vessel since leaving London. 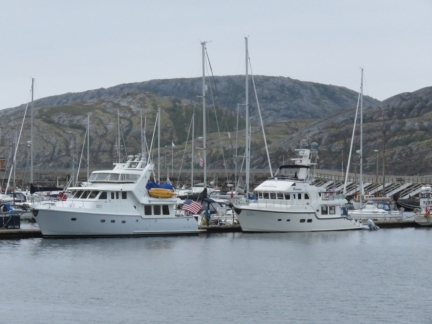 We’ve been corresponding with Nordhavn 57 Summer Star owners Kristina Thyrre and Atle Moe for years, and much more so recently since we’ve both been in Norway. They are heading north as we are returning south, and we’d been hoping to cross paths and finally meet in person. 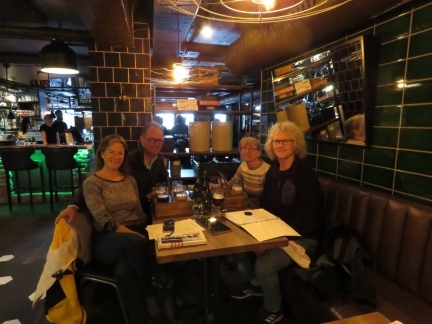 We had an exceptional evening with them, first on Summer Star, then over dinner at Hundholmen Brygghus and Gastropub, then later on Dirona.